1222 metres above sea level, train 601 from Oslo to Bergen careens off iced rails as the worst snowstorm in Norwegian history gathers force around it. 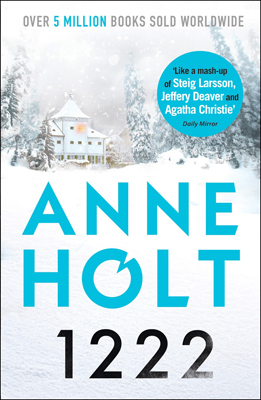 Marooned in the high mountains with night falling and the temperature plummeting, its 269 passengers are forced to abandon their snowbound train and decamp to a centuries-old mountain hotel. They ought to be safe from the storm here, but as dawn breaks one of them will be found dead, murdered. With the storm showing no sign of abating, retired police inspector Hanne Wilhelmsen is asked to investigate. But Hanne has no wish to get involved. She has learned the hard way that truth comes at a price and sometimes that price just isn't worth paying. Her pursuit of truth and justice has cost her the love of her life, her career in the Oslo Police Department and her mobility: she is paralysed from the waist down by a bullet lodged in her spine. Trapped in a wheelchair, trapped by the killer within, trapped by the deadly storm outside, Hanne's growing unease is shared by everyone in the hotel. Should she investigate, or should she just wait for help to arrive? And all the time rumours swirl about a secret cargo carried by train 601. Why was the last carriage sealed? Why is the top floor of the hotel locked down? Who or what is being concealed? And, of course, what if the killer strikes again? Anne Holtspent two years working for the Oslo Police Department before founding her own law firm and serving as Norway's Minister for Justice in 1996/97. Her first book was published in 1993 and she has subsequently developed two series: the Hanne Wilhelmsen series and the Vik/Stubo series. Both series will be published by Corvus.